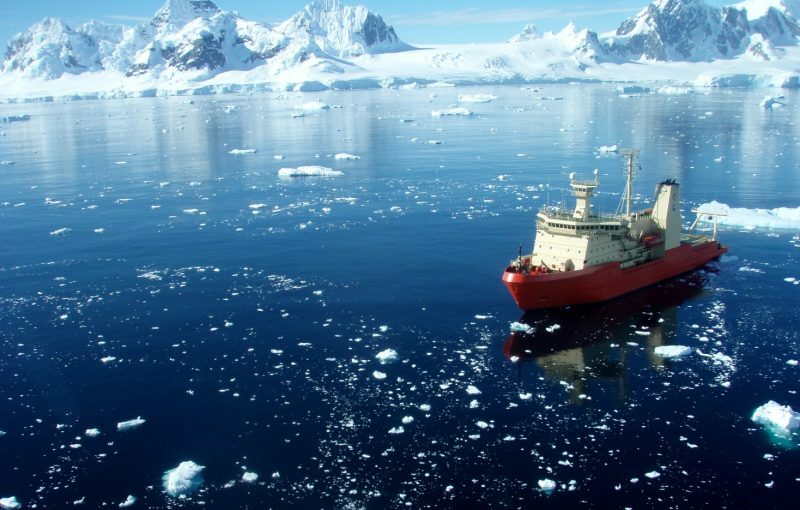 Following the adoption and implementation of a prohibition on the use and carriage of heavy fuel oil (HFO) by ships operating in the Antarctic, the Clean Arctic Alliance (CAA) is campaigning to establish similar environmental protection measures in the Arctic. The goal of the HFO Free Arctic Campaign is to eliminate the use of HFO and carriage of HFO bunkers by ships operating in the Arctic. Launched in May 2016, the campaign does not address the carriage of HFO or heavy gas oil cargo, as there is limited information available on volumes carried and routes used. The Arctic Council’s Protection of the Arctic Marine Environment (PAME) Working Group began assessing HFO in the Arctic in earnest following the landmark 2009 Arctic Marine Shipping Assessment (AMSA) which concluded “the most significant threat from ships to the Arctic marine environment is the release of oil through accidental or illegal discharge” and recommended that Arctic States “cooperatively support efforts at the International Maritime Organization (IMO) to strengthen, harmonize and regularly update international standards for vessels operating in the Arctic”. A subsequent report commissioned by PAME concluded that “in light of the particular HFO properties, significant risk reduction will be achieved if the on-board oil type is of distillate type rather than HFO”. A ban on HFO use and carriage as fuel and cargo in the Antarctic area came into effect in 2011 following tacit amendment of the International Convention for the Prevention of Pollution by Ships (MARPOL Convention), while Part II-B of the International Code for Ships Operating in Polar Regions (Polar Code) includes a provision encouraging application of the Antarctic provision when operating in Arctic waters. In 2016, CAA members submitted papers on the risks associated with ships using HFO in the Arctic to the IMO. Arctic indigenous leaders provided a valuable perspective of the frontline of a changing Arctic, and as the first responders of a potential Arctic oil spill. The IMO recognised the concerns expressed regarding the protection of Arctic indigenous food security from the effects of shipping, and in 2017, Canada, Finland, Germany, Iceland, the Netherlands, Norway, and the United States, with the support of Russia, Denmark and Sweden, proposed a new output on measures to reduce the risks of use and carriage of HFO as fuel by ships in Arctic waters. Work on this important issue will commence at the IMO in April of 2018. There are a range of measures which could be implemented to mitigate the risks associated with HFO use in the Arctic, including spatial measures such as emission control areas (ECAs), routing measures, areas to be avoided and particularly sensitive sea areas. However, none of these measures completely eliminate the risks associated with the use HFO as marine fuel in the Arctic. Operational measures intended to reduce the risk of groundings, collisions, and spills, such as aids to navigation, mandatory pilotage, and mandatory reporting, will also not eliminate the spill risk across the whole region. The simplest and most effective mechanism to protect the Arctic from the risks associated with using HFO as marine fuel is to ban the use and carriage of HFO as bunkers. Although previous discussions on a possible HFO ban in the Arctic occurred during the development of the Polar Code, an amendment to Part II A of the Code would require a subsequent amendment of the MARPOL Convention to be legally binding. A preferable route would be to use the tacit amendment procedure, amend MARPOL, and subsequently update the Polar Code. Based on the decision of the IMO to consider measures to mitigate the risks associated with an HFO spill and the precedent set by the Antarctic regulation, an amendment to MARPOL Annex I, which regulates the prevention of pollution by oil, would be appropriate. Three primary amendments to MARPOL Annex I are possible. The first option is to add a new Chapter to Annex I dedicated to the Arctic. For example, a new chapter (see below) could include a regulation prohibiting the carriage and use of HFO as fuel and use of HFO as ballast. The language in this new chapter could be similar to that of MARPOL Annex I, Chapter 9, Regulation 43, which provides for restrictions on the use and carriage of HFO in Antarctic waters. The second option is to extend Chapter 9 to cover both Antarctic and Arctic waters with the addition of a new regulation (see below). The current regulation contained in Chapter 9 is broader than might be envisaged for Arctic waters as it prohibits the carriage of HFO in bulk as cargo. Accordingly, an additional regulation would be required to address only the specific requirements for a ban on the use and carriage of HFO by ships operating in the Arctic. The final option is to extend Chapter 9 to include both the Antarctic area and Arctic waters by adding a new provision to Regulation 43. This option is similar to the second option (see below). The Arctic Commitment, which was launched by the CAA and expedition cruise ship operator Hurtigruten in January of 2017, calls for a phase-out of the use of HFO by ships in a timely manner and urges the IMO Member States and stakeholders to advance this goal. It has been signed by over 60 organisations and individuals, see here. The aim is to encourage a broad range of stakeholders to sign up, creating a groundswell of support for the adoption of an IMO phase-out of HFO in Arctic shipping by 2020. We invite interested organisations, companies, and individuals to add their signature to the Arctic Commitment. 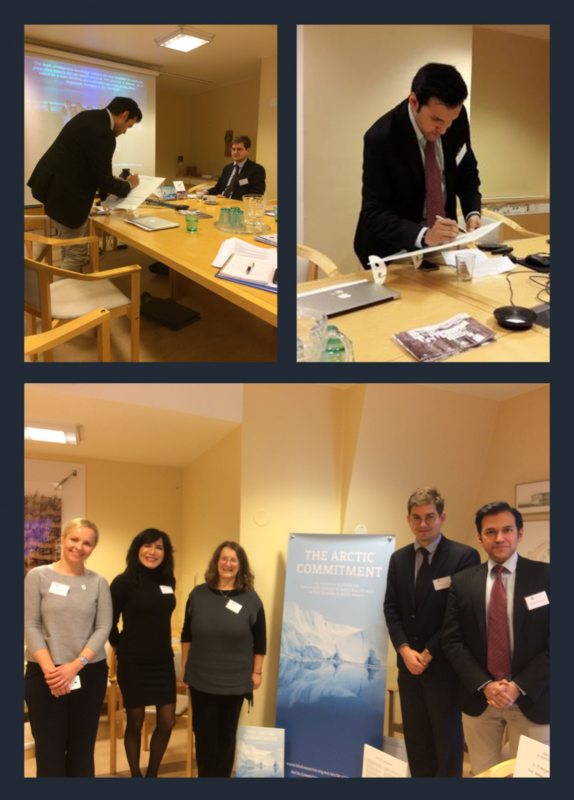 Pictured below: Dr Dwayne Ryan Menezes, Founder and Director of Polar Research and Policy Initiative (PRPI), signing the Arctic Commitment at the 10th Polar Law Symposium in Rovaniemi, Finland, on 13 November 2017. At the Symposium, PRPI co-hosted a panel discussion on ‘HFO Use in Arctic Shipping’ with the Clean Arctic Alliance, with the support of the European Climate Foundation.